Tip: Following this tutorial requires a license for IBToGo or IBLite . If you have purchased RAD Studio XE4 Professional and up, or Delphi XE4 Professional with Mobile and up, you have received a key for an unlimited development and deployment license for IBLite. If you are a trial user, and would like to test InterBase on iOS, you can get access to an IBToGo test deployment license during your trial. To activate your deployment trial license, please follow this link: InterBase ToGo Deployment . This tutorial describes the basic steps to browse data managed by InterBase ToGo on your iOS device through the dbExpress framework. 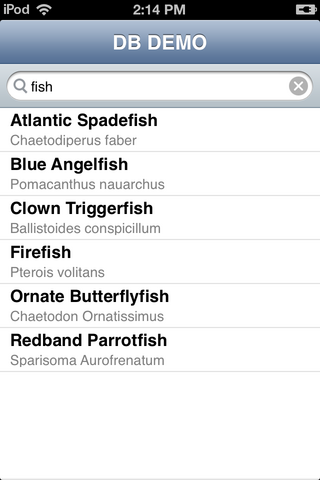 For the iOS platform, dbExpress supports InterBase ToGo as well as SQLite. These database products can run on iOS devices. For other databases, such as Oracle, you need to have at least a client library. On Windows platforms, the client library is provided as a DLL to connect to. Therefore, you need to develop applications using middle-tier technologies such as DataSnap to connect to these database products from iOS devices. Another tutorial discusses how to connect to Enterprise Database without using a client library on iOS device; see iOS Tutorial: Connecting to an Enterprise Database from an iOS Client Application. 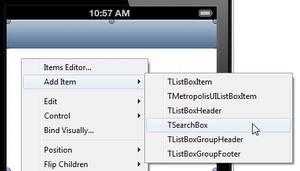 To create an HD FireMonkey Mobile Application, select File > New > FireMonkey Mobile Application - Delphi > Blank Application. Drop a TListBox component on the form. Set the Align property to alClient, so that the ListBox component uses the entire form. Set the DefaultItemStyles.ItemStyle property to listboxitembottomdetail. Set the Align property for the TLabel component to alClient. Set the TextAlign property to taCenter. 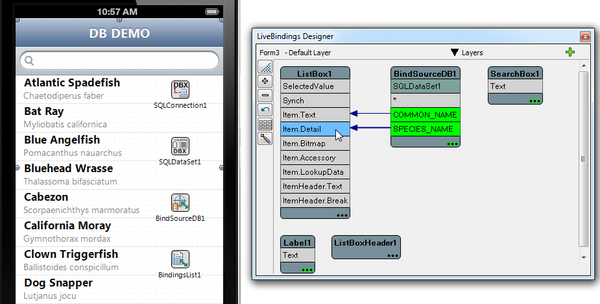 Click COMMON_NAME in BindSourceDB1, and drag the mouse cursor to Item.Text in ListBox1. 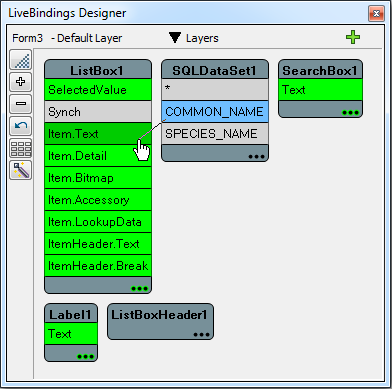 Click SPECIES_NAME in BindSourceDB1, and drag the mouse cursor to Item.Detail in ListBox1. Up to this point, you have used InterBase on your desktop. This means that the actual database is located at your local hard disk drive (for example, C:\Users\Public\Documents\RAD Studio\11.0\Samples\Data\dbdemos.gdb). On the iOS Device, the application is sand-boxed, and typically you can only read and write data that is located in the Documents folder under your application folder. Deploy the database to the iOS Device. Change the configuration (to connect to the database file) to a local file under the Documents folder. Select All-Configurations - iOS Simulator platform from the drop-down list of target platforms at the top of the Deployment Manager. InterBase ToGo. You need to select the license to be used when deploying the application on the device. The suggested names for the license files available are listed in theFeatured Files dialog, under the following name pattern: reg_*.txt. As you can see in the image below, for this tutorial, the reg_ibtogo.txt license file is selected. If you have saved that file over reg_ibtogo.txt or reg_iblite.txt in the location below (for example, C:\Users\Public\Documents\InterBase\redist\InterBaseXE3), you can just select the desired license. 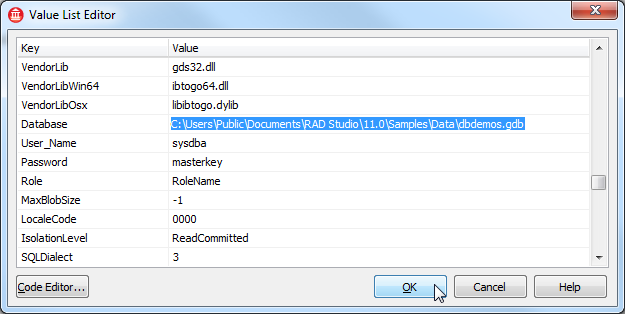 Select Add Files, and select the database file (for example, C:\Users\Public\Documents\RAD Studio\11.0\Samples\Data\dbdemos.gdb). Select dbdemos.gdb, and change Remote Path to StartUp\Documents\. Ensure that iOS Simulator and iOS Device are present for dbdemos.gdb. Select All-Configurations - iOS Device platform, and make sure dbdemos.gdb is set to be deployed to StartUp\Documents\. As you just configured, the database file (dbdemos.gdb) is to be deployed to the Documents folder in the sandbox area of your iOS app. The GetHomePath function gives you the actual home location of an iOS app. Using the PathDelim constant is recommended, as PathDelim specifically uses the path delimiter of the target platform (instead of hard-coded delimiters, such as \ or /). If you get an error ("unavailabale database") when you connect to the database in the development environment, this means you do not have a current license for InterBase. 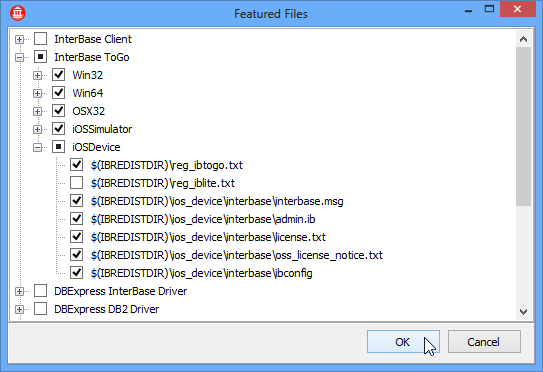 A license for InterBase Developer Edition is included as part of the product for some product editions. To activate the license of InterBase Developer Edition for a registered RAD Studio installation, go to the Embarcadero Product License Manager (click Start | All Programs | Embarcadero InterBase XE3). If your application raises an exception without having proper exception handling code, your iOS app simply crashes (disappears) at run time. Check whether the dataBase file (dbdemos.gdb) is delivered to 'StartUp\Documents\'. Check whether the license file is delivered for InterBase ToGo. 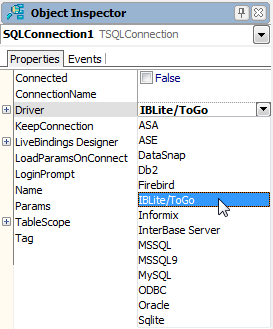 Check whether you pointed to the local file (add an event handler for the OnBeforeConnect event of the SQLConnection1 component).